As odd as it may sound, it’s really hard to actually write about The Night Before. 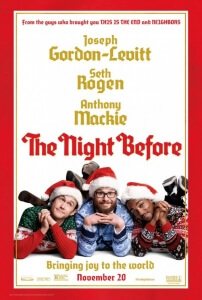 You wouldn’t think it was so – after all, it’s an adults-only stoner Christmas movie with Seth Rogen, his 50/50 director Jonathan Levine and co-star Joseph Gordon-Levitt, and Anthony Mackie – but it’s much more difficult than you would expect. Why? Because it’s so demented, so chaotic and so off-the-charts in just how strange and weird it is – and yet, it’s not necessarily a bad movie. It would definitely be easier to talk about if we knew for sure whether we thought it was good or bad, but we still have no idea, even as we’re writing this review. It’s definitely nowhere near as good as some of Rogen’s previous stoner comedies like Knocked Up or This Is The End, but at the same time it didn’t annoy us as much as, say, Bad Neighbours did. It is its own thing, and in a bizarre way it’s worth checking out just to see how much it is its own thing. The Tracy Morgan-narrated prologue tells us – in rhyme, no less – how in 2001, shortly before Christmas, Ethan’s (Gordon-Levitt) parents die in a car accident, and how his friends Isaac (Rogen) and Chris (Mackie) decide to take him out for Christmas Eve as a means to make him feel better, a tradition they continue for the next few years. However, as this present Christmas approaches, and what with Isaac about to be a father and Chris becoming a famous sports star, the three decide that this will be their last festive night out together – but where will that leave Ethan? Exactly how many drugs, gifted by Isaac’s wife (Jillian Bell) as a thank-you for being strong throughout the pregnancy, will Isaac digest throughout the night? And just what is the deal with Michael Shannon’s odd drug dealer Mr. Green? Shannon is the undisputed highlight of the entire film, and also a neat summary of the movie in general; very straight-laced, sometimes comedic, but all the while completely and totally deranged when you scratch the surface (it’s worth the price of admission just for his second-to-last scene in the movie, without giving anything away). As entertaining as Shannon is, however, he’s only in it for a handful of scenes, leaving the strangeness mostly to Rogen and his extended drug trip as the night carries on. From having imagined conversations with a nativity set to being curiously intrigued by a series of graphic text messages he receives (the identity of whom will put a smile on the faces of Rogen fans) to recording a cocaine-induced video about his hidden stance on fatherhood, Rogen carries the oddness on his shoulders for the majority of the film and delivers exactly what you’re expecting with this kind of film. Even weirder, the strangeness of the film isn’t even limited to Rogen and Shannon. 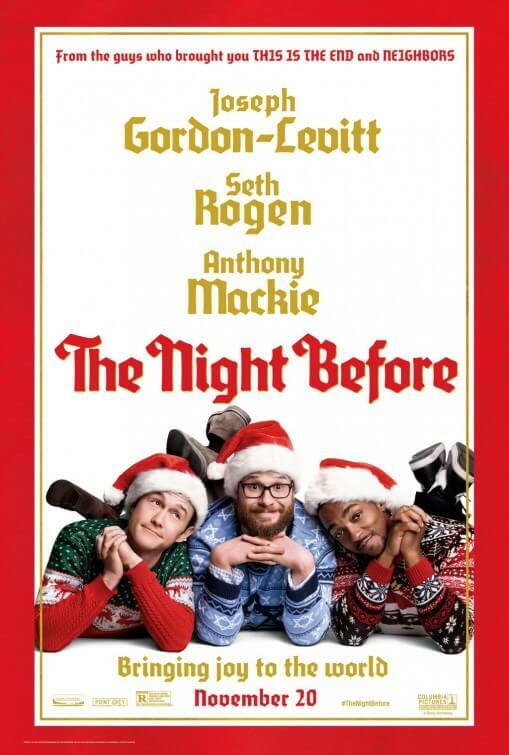 Gordon-Levitt and Mackie get into their own odd escapades throughout the night, with the former bumping into his ex-girlfriend Diana (Lizzy Caplan) repeatedly and even getting beaten up by a couple of drunk Santas, and the latter – in one of the oddest sub-plots of the movie, and that’s saying a lot – is antagonised by a strange woman (Ilana Glazer) who steals his weed and also money from a charity box because she wants to be like the Grinch for some reason (her final scene where she kind of explains her motives end up making even less sense when you think about it). We haven’t even mentioned what happens when they reach the elusive and exclusive Nutcracker Ball, where David Lynch-style entrances and pop star cameos await. Yet, after going into as much detail as we can without spoiling it for you dear readers, we still have no idea whether what we saw was any good or not. It’s just too demented to properly like, but it’s also not too bottom-of-the-barrel to dislike, either. It isn’t constantly a laugh-out-loud riot, but there are definitely some funny moments here and there. The characters are nowhere near perfect, but they’re not even that unlikable either. In the end, The Night Before is just a product that seems to exist entirely by itself, and in an odd way we would say it’s worth checking out just so you can get a clearer understanding than we could. The Night Before is an odd, demented Christmas stoner movie that will definitely leave you in the middle ground about whether it’s any good or not, but its strangeness is enough to weirdly recommend it.